If Youngstown State University students are looking for a free warm meal during the winter months, the Catholic Student Association is hosting their Table of Plenty dinners at the Newman Center every Wednesday at 6 p.m. 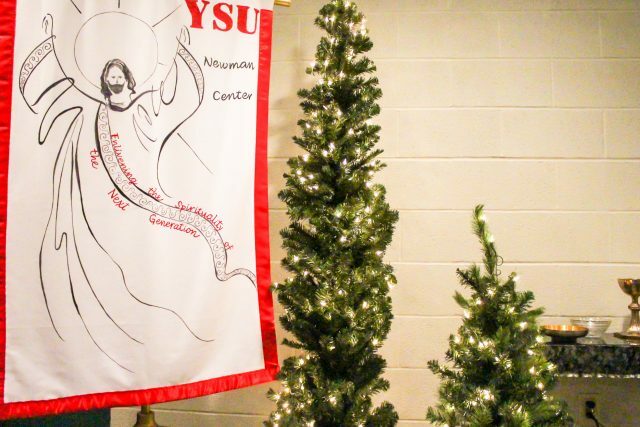 The Newman Center is a Catholic Campus Ministry that serves students, faculty and staff through sacraments, worship, faith formation, study sessions and volunteer projects. Thomas Brozich, director of the Newman Center and adviser of the CSA, said a way to begin involvement with the organization is through their Table of Plenty dinners. Brozich, his assistant at the Newman Center, Darlene Marks and the students of the CSA enjoy finding different recipes to use for the weekly dinners, ranging from bacon fried rice to pasta and meatballs. Besides the CSA’s weekly meals, the organization is working to feed homeless people in the area through their outreach project this semester. Marks is proud of the students for taking initiative with the outreach project and finding their own time to dedicate their efforts. “It’s difficult to get back into the flow of things with the semester starting again for the students, but they are starting strong with the outreach project,” she said. The CSA has brought soup and burritos to homeless people at bus stations in the Youngstown area, the Rescue Mission of Mahoning Valley and the Dorothy Day House. Kayla Phares, a junior forensic science major and president of the CSA, said she hopes to recruit more students and get them involved with volunteer opportunities. “I became a part of the CSA during the fall semester, and it has been a great way for me to get in touch with my faith, meet new people and has allowed me to volunteer through the outreach project,” she said. Phares said volunteering is one of the most important components of the CSA, and as the newly elected president, she would like to see the organization reach its full potential in this area. To get involved with the outreach projects, sign up sheets are available in the student lobby of the Newman Center.